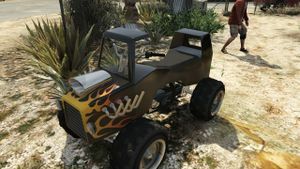 A Hot Rod Blazer, owned by Trevor Philips, in GTA V.
The Nagasaki Hot Rod Blazer is an off-road, all terrain vehicle in Grand Theft Auto V. As its name suggests, it is modeled after a hot rod. Trevor Philips receives a Hot Rod Blazer from Ron Jakowski after completing either The Time's Come or The Third Way. Like Trevor's Bodhi, the vehicle respawns at his trailer if it is lost, stolen or destroyed. However, unlike Trevor's truck, the Hot Rod Blazer is not considered a personal vehicle, meaning a new Blazer spawns each time it is taken. Michael De Santa or Franklin Clinton can also take this vehicle. This page was last modified on 3 December 2014, at 03:26.